When creating or editing a content page, type in the text you want to make a hyperlink. For example say the text is “SF State”. Highlight the text and select the chain like icon. Then fill in the URL field in the pop-up and select the OK button. 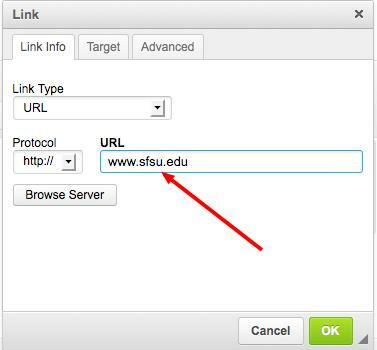 Now the text “SF State” is a hyperlink to www.sfsu.edu. You can test this by saving the page and then selecting the link.